The Civil and Administrative Tribunal Panel has judged a NSW lawyer failed to comply with costs disclosure requirements under s562 of the Legal Profession Act 2004. As a result, an order has been made to remove him from the local roll of practitioners. The lawyer repeatedly failed to comply with disclosure of costs. Other contributing factors included a failure to comply with the laws governing the handling of trust money and instances of severe overcharging. Lawyers Weekly reported that the panel passed the judgement despite a ‘deep apology’ from the lawyer. This order enforces the legal requirement for clear and professional communication with clients. This shows that cost agreements that include detailed expectations should be signed by your client before you proceed on the matter. Is it worth your time to obtain a signed cost agreement? If you were to ask the Office of the Legal Services Commissioner (OLSC) this question, the response would be a firm yes. The OLSC works with law societies to advise lawyers on professional obligations. They have placed costs disclosure and billing practices at number five on the ten fundamental objectives for practice management. In the OLSC’s 2016-2017 report, written complaints are directly linked to clients’ misunderstandings of the costs involved in legal services. Overcharging (12.3%) and communication (12.8%) are listed in the top three types of complaints received. It takes on average 72.3 days to resolve a complaint, which can hold up the processing of the legal matter and impact your firm’s revenue and reputation. It’s human nature that an unhappy client will share their negative experience. You can mitigate the risk of complaints by obtaining signed cost agreements. Modern firms are streamlining business processes with automated cost agreements, or disclosure notices, that are available directly from their practice management software. With LEAP, your client and matter information is merged seamlessly into a cost agreement. From your LEAP matter you can request an e-signature for the cost agreement. 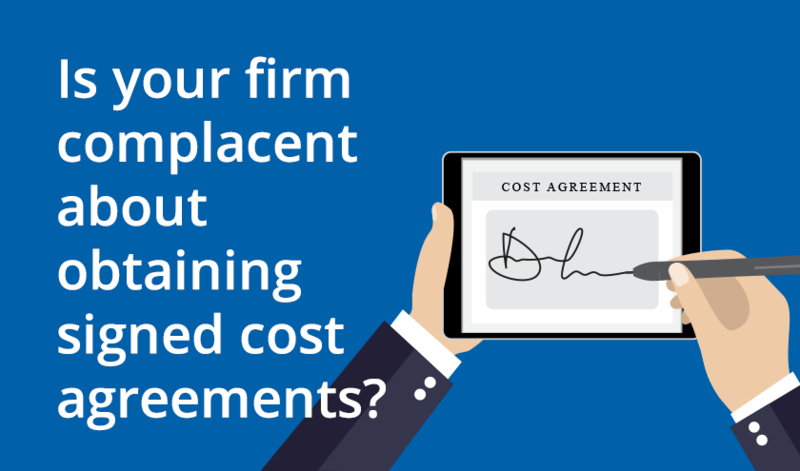 This process allows your client to electronically sign their cost agreement. You will be notified of real-time updates on this process, so you always know when your client has viewed and signed their cost agreement. This process makes it simple to meet the strict requirements of disclosing costs to your clients. An electronic signature is a visual representation of a person’s name placed on a document. Having your client electronically sign their cost agreement is an easy process. There is no need for your client to print, sign, scan and then email or post the agreement to you. This process removes the hassle for your client and means that you can receive the signed cost agreement sooner. Electronic signatures on cost agreements are recognised under Australian and international law as a valid method of executing agreements. Read FindLaw’s article on the legal validity of e-signatures in Australia for further information. Yes, electronic signatures are secure. When using an electronic signing platform, like DocuSign, there is a process that identifies the person before they sign. This process tracks the internet protocol (IP) address of the person, which provides information on the person’s device, location and identity, making it more secure than wet signatures. Through LEAP you can safely send your documents to clients to electronically sign through our partnership with DocuSign. The Legal Services Council’s Information Sheet states that law practices must “take all reasonable steps” to be sure that the client has given consent to the course of action and costs. All Australian jurisdictions have similar rules to adhere to. A signed cost agreement is an easy way to meet your responsibilities under this obligation. how to securely store the signed cost agreement. LEAP’s partnership with DocuSign make the signing process easy for you and your client. This process saves your firm a considerable amount of time when sending cost agreements for signing. Find out more. Click here to get started with e-signatures for your cost agreements through LEAP. From LEAP you can access more than 50 precedent cost agreements that are set up for electronic signing. A precedent cost agreement auto-populates the matter details, along with your hourly rates, trust retainer instructions and disbursements, into a cost agreement. These cost agreements are accessible through By Lawyers, a LEAP companion product. This level of automation reduces the administration burden for your law firm, so you can concentrate on working on your clients’ matters. View the time-saving By Lawyers guides and precedents which small law firms rely on. Previous article Is your firm a Blockbuster or a Netflix?